Growing up, art was an important part of Dana's life. Throughout her life, she collected images, experiences and emotions expressing them through her art, relying on intense colors and incorporating various forms, patterns and textures, channelling this talent through her graphic art as well as her painting. Dana built on this passion for art and design in her undergraduate studies by completing a bachelor’s degree in visual communications from the University of Indianapolis - USA. After finishing university, she relied on this innate talent as well as her acquired technical skills to take up various positions as a professional graphic designer in both marketing agencies and publishing houses. She progressed in her career into opening her own boutique design house that offered both print and web design services. For Dana, art is creation, transformation and a medium of expression. 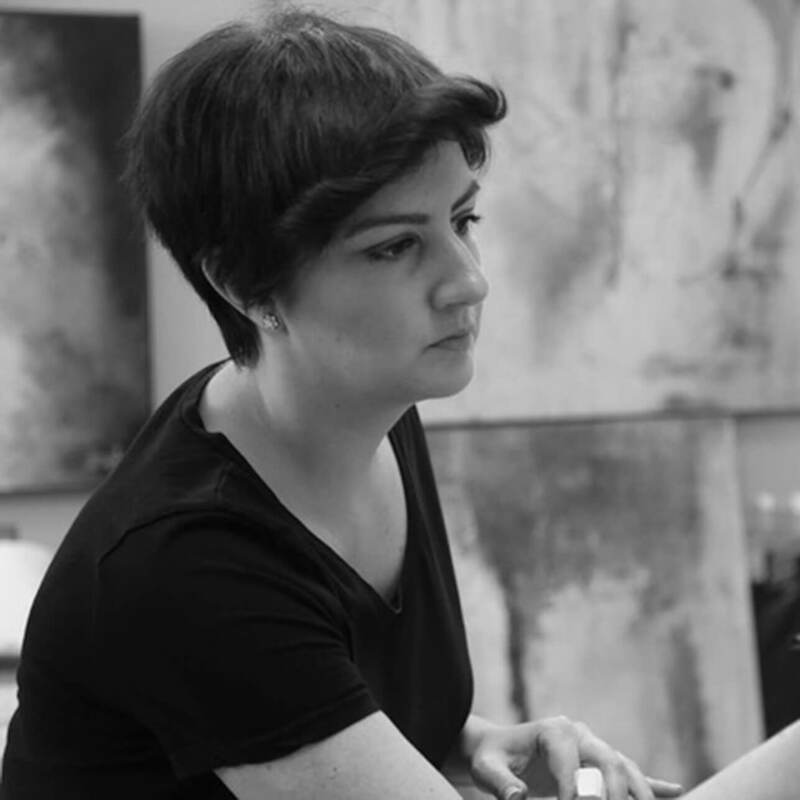 Her work concentrates on creating abstract surfaces through her favourite medium; acrylics, but works in oil and has experimented with a variety of mixed media such as pastels, ink, wire, fabric, silk screen and many others. She incorporates the vibrant and textured features into the paintings through the use of thick brushes, pallet knives and sponging. Working largely with wide edge canvas, Dana is preparing for her first exhibition. She is also currently accepting commissions to create pieces of any size. With the ambitious goal of exhibiting her visual expressionist and abstract paintings around the globe and of displaying her work in exclusive galleries and private collections, Dana wants to offer a new twist to the art scene in Dubai and eventually, around the world. Her paintings present deep emotions; each canvas tells a story of her personal journey to discover her identity as an artist. She takes her inspiration from day to day experiences and emotions turning them into physical expressions and visualizations with constantly changing colors and shapes. Dana is captivated by the colors she can create, and strives to construct an entire world on her canvas, relishing in the freedom to design multicolored emotional forms within her unique work of art. Her style is abstract expressionist and paints intuitively, drawing upon her emotions and imagination rather than working from photographic images. Dana paints "to 'express', conjuring abstract images found in nature and captured through her love of photography. Her art style is also contemporary, utilizing different art methods. She is not afraid to try and mix bright colors because art should be an adventure. She is interested in a variety of elements involved in the creation and destruction of surfaces - regularity and irregularity and the relationship between minimal form and surface texture.